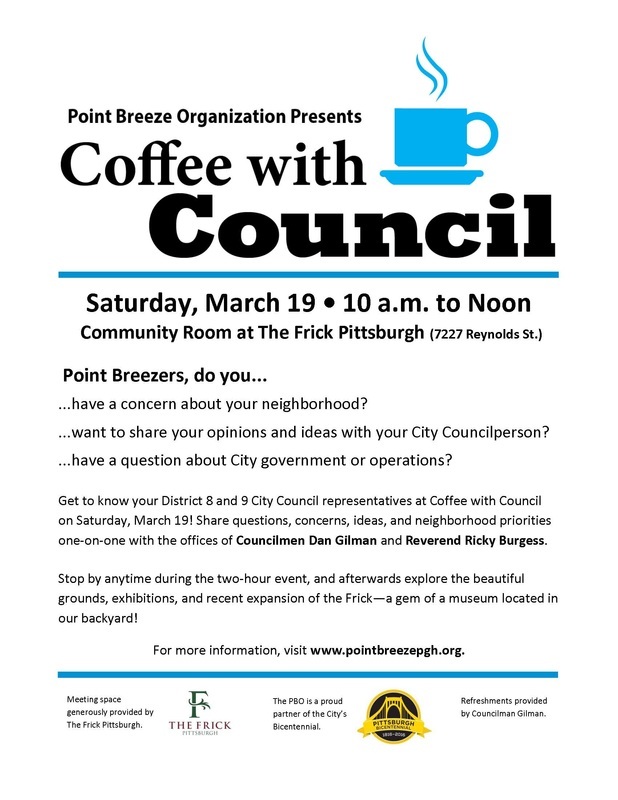 On Saturday, March 19, District 8 Councilman Dan Gilman and legislative assistant Alicia Carberry along with Shawn Carter, chief of staff for District 9 Councilman Ricky Burgess, participated in Point Breeze's "Coffee with Council" at The Frick Pittsburgh. Point Breeze residents were invited to stop by to discuss concerns, ideas, and priorities for our neighborhood. The event was an informal way for Breezers to talk one-on-one with our City Council representatives. Thank you to the residents who attended, Dan, Alicia, and Shawn for spending their Saturday morning with the residents of Point Breeze, and especially to the kind staff at The Frick Pittsburgh for allowing us to hold the event in their community room!